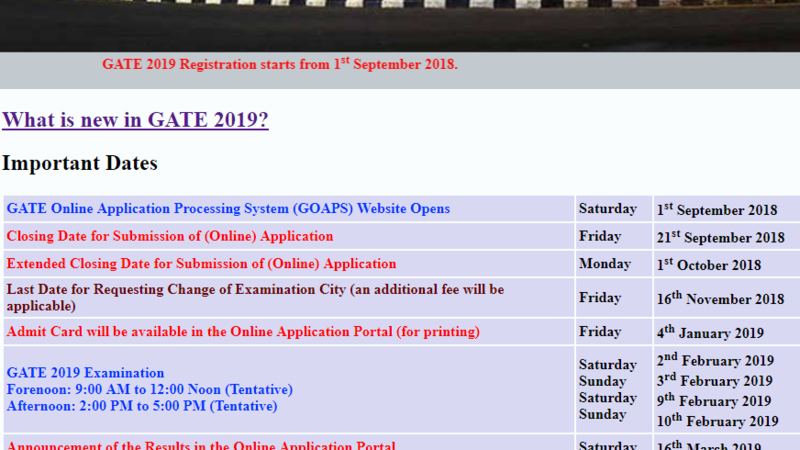 GATE 2019 registration procedure to be commenced from 1st September This year, Indian Institute of Technology, Madras would organise the Graduate Aptitude Test in Engineering in the month of February. For that, the online registration is to be commenced within a few days. And, all the applicants must enrol themselves for the examination before the last date i.e. 21st September. The administration has added statistics as the 24th Subject examination is to be held for. Examinations for all the 24 subjects will be conducted on 2nd, 3rd and 9th February in morning and evening shifts. One candidate can appear only for one paper in any one session that includes Biotechnology, Aerospace Engineering, Architecture and planning, Agricultural Engineering, Instrumentation Engineering and many other subjects. IIT Madras has Scheduled 16th November as the last date for change of examination city (an additional fee would be charged for it). Students who are going to appear for the new subject can check out the syllabus from the official website. 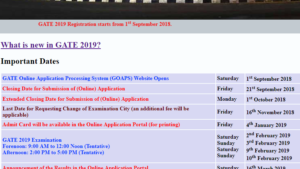 The Institution will also accept the online applications through this website – gate.iitm.ac.in. There is no minimum or maximum age limit included in eligibility criteria. Instead of only Aadhar Card, candidates have to specify any one of the following identity documents during submission of online application – Voter ID card, PAN Card, Passport, Aadhar-UID, College ID, Employee ID or Driving License. On the exam date, candidates will have to bring the original photo ID proof along with the admit card. For calculations, a Virtual Scientific Calculator will be provided on the computer screen during the examination. Candidates with personal calculators, mobile phones, wristwatches or any other objectionable items will not be allowed to move inside the examination hall. Admit cards for the examination would be provided from 4st January 2019. It can be downloaded from the official portal of the institution. Admit cards will not be sent to the candidates by post or e-mail. Question paper of GATE 2019 exam will comprise of two different types of questions – Multiple Choice Questions and Numerical Answer Type questions. Negative is applicable for MCQs only. No mark would be deducted for attempting the Numerical Answer Type questions. Stay Tuned With ALL INDIA ROUNDUP For Latest Updates.